In gardening, small things often have larger meaning. A single flower, pressed, becomes a memory for life; an acorn planted on a whim can grow to shade a city block. Such is the case with the humble rolling cart marked “Book Sale” parked just inside the Lenhardt Library’s doors. It’s connected to a much larger story. The cart rolls out as summer (and visitor attendance) ramps up; this year’s rollout date is June 7. All of the books on it are garden-related, and most are donations brought in by folks like you. Other books are deaccessioned from the library’s stacks. Prices for both hardbound books and paperbacks are modest, and the cart is replenished throughout the season. In short, what gardener could resist? Last year, more than 500 books were sold. This is where the story grows. With last year’s proceeds, the library then purchased a rare book (actually a two-volume set): Flora Boreali-Americana by André Michaux. Have any gardening books you’d like to donate? Call the library at (847) 835-8201 to arrange a drop-off (garden topics only, please). A librarian will cross-check the index to see if they’re needed in the collection; if not, they’ll be added to the sale. Last year’s book sale generated enough funds to purchase this 1820 edition of Flora Boreali-Americana. In 1785, France’s King Louis XVI sent André Michaux (1746–1802) to the United States to collect plants for use as building materials, for medicine, and in agriculture. (France had used up its natural wealth of forests.) With his then 15-year-old son Francois André (1770–1855), gardener Pierre Saunier, and domestic Jacques Renaud, Michaux spent the next 11 years shipping boxes of plants back to France. This was thanks to collecting trips throughout the new country, plus experiments at two gardens—one established in New Jersey, on 11 acres opposite New York City, and another on more than 110 acres in Charleston, South Carolina. This work is one of two significant publications resulting from Michaux’s efforts in the United States at the end of the eighteenth century. Initiated by André, Flora Boreali-Americana (Flora of North America) was largely completed by his son. The black-and-white illustrations are by one of the world’s foremost botanical illustrators, Pierre-Joseph Redouté. Significantly, this 1820 edition is simply a reissue of the original 1803 edition. The only change is a different title page. This edition is scarcer than the original 1803 release. The copper engraving illustrations in this publication were executed by the most important illustrator of his time, Pierre-Joseph Redouté (1759-1840). 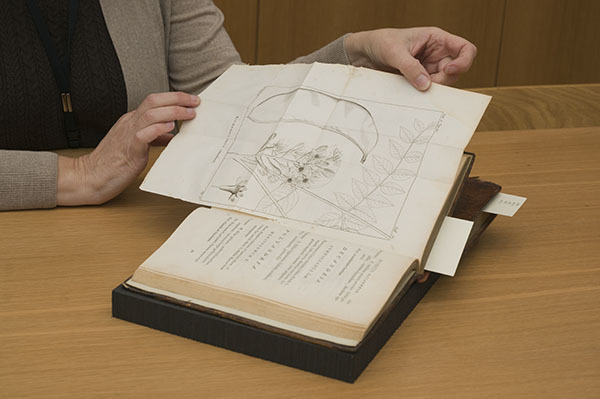 Leora Siegel, director of the Lenhardt Library, purchased the set for the Garden’s rare book collection in September 2012. It’s a beauty, with original leather bindings and marbleized paper endsheets. And those incredible Redouté illustrations! Like most of the books in our rare book collection, it can be viewed at the library by appointment. You, the gardener, get to recycle books you’ve known and loved into the hands of other gardeners. Garden and Lenhardt Library visitors get the chance to learn about gardening while purchasing a book for a song. The library gets to build its rare book collection simply by providing the venue for the exchange. What does Siegel have her eye on this year? American Medical Botany: Being a Collection of the Native Medicinal Plants of the United States, by Jacob Bigelow, published in 1817. I’m heading over to the bookshelves now and starting a donation stack! It’s wonderful that this book has entered the CBG’s collection. The story of the Michaux, father and son, has always interested me. I’ll try to see the book when I am next in Chicago. great !first flora of North America. We are writing an annotated translation of Michaux’s diaries.